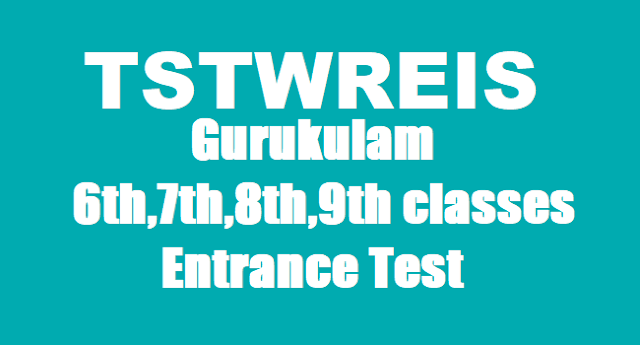 TS Tribal Welfare 6th,7th,8th,9th Classes Entrance test 2019 #TSTWREIS Girijana #GURUKULAM Admission Test 2019: Telangana State Tribal Welfare Residential Educational Institutions Society (TSTWREIS) has given the 6th to 9th classes Entrance Test 2019 Notification in April 2019. Girijana Gurululam TS TWREIS Entrance Test 2019 for admission into Classes VI to IX in Telangana TWR Schools for the Academic Year 2019-2020. Ninety (90) Telangana Tribal Welfare Residential Schools are functioning under the aegis of Telangana Tribal Welfare Residential Educational Institutions Society (TTWREIS, Hyderabad), out of which 88 are General Tribal Welfare Residential Schools, (2) PTG Residential Schools. It is decided to conduct entrance test for filling up of back log vacancies with ST Students only for admission into VI to IX classes in General ST. Residential Schools & PTG schools. In this regard, the following notification has to be issued to take up the admission process into Telangana Tribal Welfare Residential Schools for the academic year 2019-19.
a) For 6th Class: SC / ST students should have born between 01.09.2005 to 31.08.2009 and OC / BC / SC-Converted Christians (BC-C) should have born between 01.09.2007 to 31.08.2009.
b) For 7th Class: SC / ST students should have born between 01.09.2004 to 31.08.2008 and OC / BC / SC-Converted Christians (BC-C) should have born between 01.09.2006 to 31.08.2008.
c) For 8th Class: SC / ST students should have born between 01.09.2003 to 31.08.2007 and OC / BC / SC-Converted Christians (BC-C) should have born between 01.09.2005 to 31.08.2007.
d) For 9th Class: SC / ST students should have born between 01.09.2002 to 31.08.2006 and OC / BC / SC-Converted Christians (BC-C) should have born between 01.09.2004 to 31.08.2006. Applications are invited through online separately for SOE & for filling up of backlog vacancies of other institutions of Gurukulam through the website http://www.tgtwgurukulam.telangana.gov.in an amount of Rs.30/- will be collected from each candidate while applying for screening test, candidate can apply through online at the nearby TTWR School or any Meeseva Centre. A screening test will be conducted for admission into 8th class SOE, Khammam and backlog vacancies of other institutions separately and allotment of seats will be done through online on merit basis only. Mobile No and Date of Birth in the required field. Step 5:. Download your TSTWREIS CET Download Hall Ticket and take the print for future reference. The Entrance test will be of objective type & multiple choice questions from Class 5th to 8th standard. A screening test will be conducted for admissions into entry point 8th class and for back log vacancies of 6th to 9th class in 86 TTW General Residential Schools. The pattern of the question paper is as follows. The test will be for 100 marks in objective type based on the previous year syllabus. The Weightage of marks for different subjects and form of questions is furnished here under.